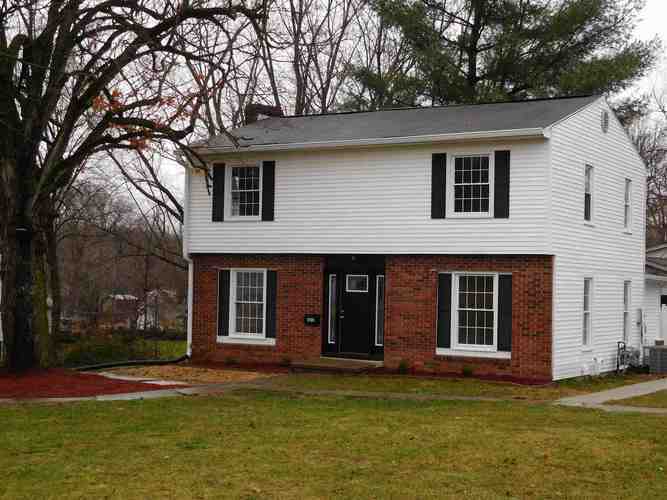 This move-in ready 3BR/2.5 Bath 2 story home has been enhanced throughout. NEW doors, wood laminate floors, carpet, ceramic tile, Furnace, A/C, lights, sinks, faucets, ceiling fans & more. Handsome kitchen has new cabinets, counter tops, tile floor, new Frigidaire stainless appliances, including a 5-burner gas range. All 2.5 baths have been completely remodeled. The expansive living room has an attractive fireplace. An extra large family room could easily serve as a main floor master BR, as it adjoins an updated bath. The seller opened up the kitchen & DR--sure to be the entertainment hub. Tall replacement windows fill the home with light. There's a 768 SF unfinished walk-out basement, ideal for work or play. Plenty more to win your heart, at a great price. Directions:From State Road 46 West in Ellettsville, turn South on Sale St. Home is on the corner of Sale and Ritter.